With the arrival of Yerry Mina at FC Barcelona, the club have reached new heights in defence -literally. The Colombian is 1.95 metres tall, and is the tallest player in the squad. Gerard Pique is the closest to him in height, at 1.94 metres, and Sergio Busquets measures 1.89 metres. This will undoubtedly be a boost to the Barça back line in their aerial play. Mina is also the seventh tallest player in LaLiga. Déportivo La Coruña goalkeeper Costel Pantilimon is the Spanish league's giant, at 2.03 metres, and Getafe's Filip Manojlovic is just behind him at 1.97 metres tall. 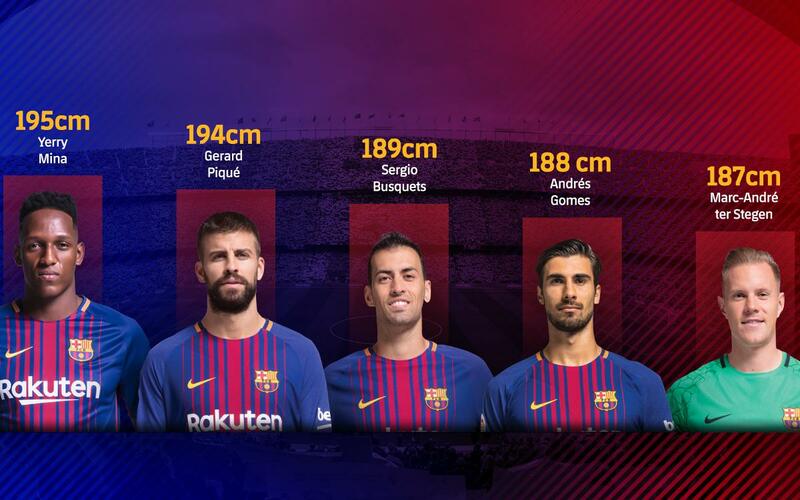 At the other end of the scale, Leo Messi and Jordi Alba are the shortest players in the Barça squad, at 1.70 metres tall. Pablo Piatti (1.63) and Marcelo Díaz (1.66) are the shortest in LaLiga.